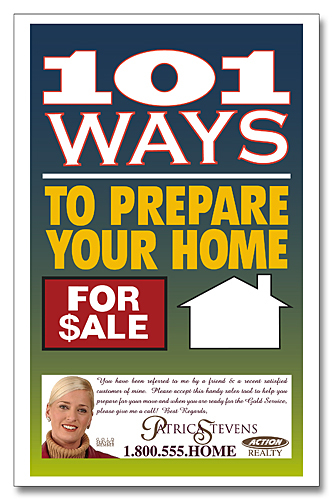 36 page booklet with great information on getting your house ready for the real estate market. Full of tips & hints that will help you sell your house quickly. Information includes help with updating and upgrading the appearance to motivate potential buyers. Price include printing in full-color (four color process) on front cover only. Metallic or fluorescent colors cannot be printed in full-color (four color process).